They'll scream for ice cream - tattoos, that is! 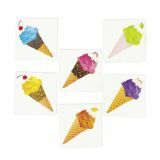 Easy to apply and remove, these Ice Cream Party Tattoos will add a sweet look to partygoers. Drop a few in your birthday party goody bags or use them as confetti at your table of presents or treats. Safe and non-toxic. Paper. (6 dozen per pack) 1 1/2" x 1 1/2" Assorted.